UMC is El Paso's only designated Baby-Friendly hospital. Out of over 5,600 hospitals in the United States, there are only 445 active Baby-Friendly hospitals and birth centers. UMC is one of them. The Baby-Friendly Hospital Initiative provides recognition for maternity facilities that create an optimum environment for infant feeding and maternal-newborn care. 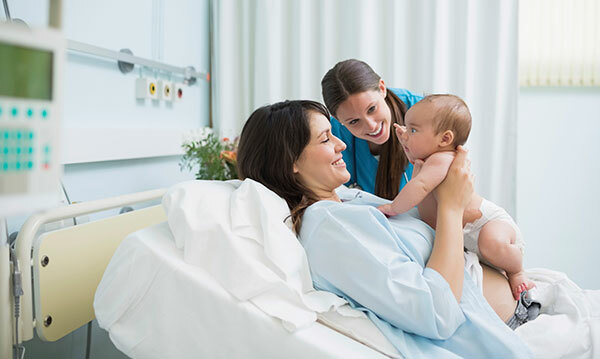 Acieving "Baby-Friendly" designation involves multiple professions: nursing, pediatrics, obstetrics, midwifery, childbirth education and nutrition. On the UMC campus that means involving the hospital, the medical school, and the NICU at El Paso Children's. To understand all the tremendous benefits breastfeeding means for mother and baby, check out this real life story. The Mother/Baby unit, located in the Women's Pavilion, features 30 all-private postpartum suites providing comfort, convenience and privacy. Couplet Care gives mother and baby care in the same suite. This helps to promote a deeper bonding experience for the entire family. Each suite includes a sleeper chair, bassinet and private bath. Our unique affiliations help us to give quality healthcare for mothers and babies at all times. We have teamed-up with the Paul L. Foster School of Medicine where private practice physicians and subspecialists can make sure a physician is available to work around the clock with our highly trained staff. Along with patient care, patient safety and security are top on our priority list. We have security measures in place for the safety of all mothers and babies. Video cameras monitor to ensure mom and baby are safe and together. Our hugs and kisses infant security system supplies both mother and infant with matching security bracelets programmed and monitored to reduce any risk of infant abduction. A mother is just a high speed elevator away from her baby, too. Donors make a difference in Mother Baby. Entirely funded through University Medical Center's Foundation, the Healing Arts Program integrates dynamic and inspirational art from local and regional artists in every area of the hospital including the Mother Baby, improving the hospital experience for patients, families and caregivers. Donors interested in more information on Mother Baby donor opportunities that impact our community's population can email donate@umcfoundationelpaso.org or click here to donate now. Foundation volunteers provide amenities and special support to Mother Baby patients and families. To learn how to become a volunteer, email volunteer@umcfoundationelpaso.org.